Highways England announced their Preferred Route (5A) on 11th May 2018: click here to read their announcement brochure. Despite the many faults of their consultation, including misinformation and spin towards 5A, some of which will be brought to the courts in the Judicial Reviews on 27-29 November, they have not retracted their Preferred Route announcement, even though on 12 Oct 2018 they were forced to announce the consultation would be re-run with more correct information. Below are Highways England's map and promotional video for this, massively destructive, Route 5A. Believe some of what you see, don't believe the expensive bits like the viaduct, and be very aware of what you don't see - the beauties and tranquility of the natural and historic landscape, and the rural communities next to the road whose presence is hidden by the video, in the ancient village communities of Binsted and Tortington. 1. It would ruin a beautiful area of the South Downs National Park where Binsted Woods (250 acres, ancient, broadleaved, huge, wonderful and mysterious) meet many good footpaths leading from coastal villages and towns; including Binsted Park (see video below). 2. 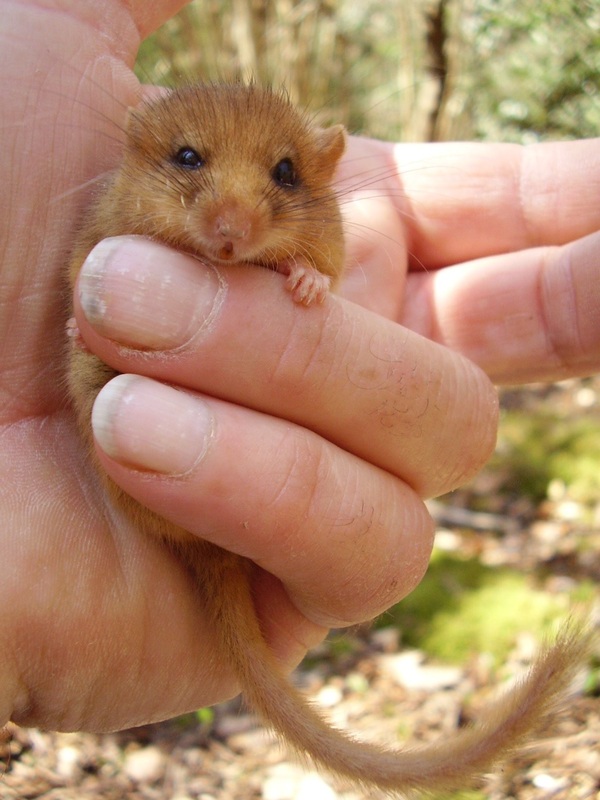 It would severely impact the very rich wildlife of Binsted Woods by destroying woodland and cutting off the Woods from their connecting mosaic of habitats. 3. It would destroy the peace, tranquillity and beauty of this area and the unity of its historic cultural heritage. 4. It would be mostly on a 7 to 9 metre embankment through a much-loved wooded and farming landscape where the village of Binsted, with 10 listed buildings and a 12th century church, lies partly within Binsted Woods and partly in lovely rolling countryside. 5. It would destroy the village of Binsted as a special place by cutting off 4 of its 38 houses from the rest and blighting others. Three houses within the woods would be 75m from the new road, which would tower over them on a high embankment. 6. It would cause the present good recreation and learning activities in the area to cease, such as the Binsted Arts Festival, the Binsted Strawberry Fair (an event that has raised £100,000 over 30 years for charities and the fabric of the church), Ratpack Archers crossbow club courses within the woods, and the Forest Knights countryside experience business within the woods. 7. It would put an end to the present wildlife surveys and education/volunteering activities provided by the Mid Arun Valley Environmental Survey group. 8. It would destroy a much-needed ‘green lung’ near the crowded Sussex Coastal Plain which is rapidly changing with more and more housing development so will need it more than ever. 9. It is the wrong solution to Arundel’s traffic problems which need a holistic approach with improved public transport and better facilities for non-motorised users. 10. It is money thrown away at great environmental cost, as reports have shown that new roads soon become congested. 11. 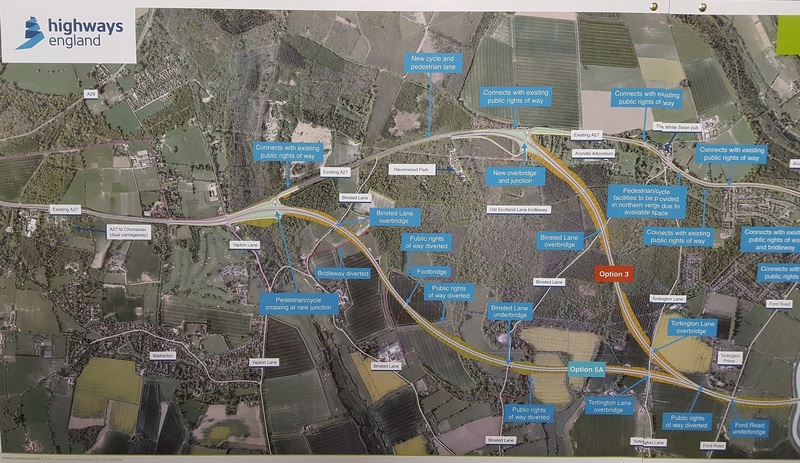 It would attract more traffic to this section of the A27 which would cause even greater traffic jams at Chichester to the west and Worthing to the east. Chichester recently lost its bypass improvement scheme due to lack of agreement and Worthing has a scheme simply to improve junctions and add traffic lights. 12. It is being promoted by Highways England with a biased consultation full of errors, which nowhere makes clear the damage to Binsted Village or Binsted Woods. So what Options were Highways England considering for a new Arundel Bypass? Option 1 is online widening at this point. Options 3 and 5A differ in that Option 3 severs and destroys the recovering ancient woodland on Tortington Common, but Option 5A severs and destroys Binsted's village, ancient woodlands and historic landscape. Options 3 and 5A are the same east of the river, so it is a choice between them and Option 1. Option 1 is half the cost of the others, and a much higher BCR (Benefit-Cost Ratio) of 3.6; it does not destroy countryside or rural communities, but it does keep the road for the most part on the present line, instead of shifting the A27 further away from Arundel town. Advocates of this alignment such as the Arundel group ArundelSCATE say that being tucked in under the town minimises the landscape impact on the watermeadows, but opponents of Option 1 such as OneArundel say that the town needs it to be taken further away. What do you think? 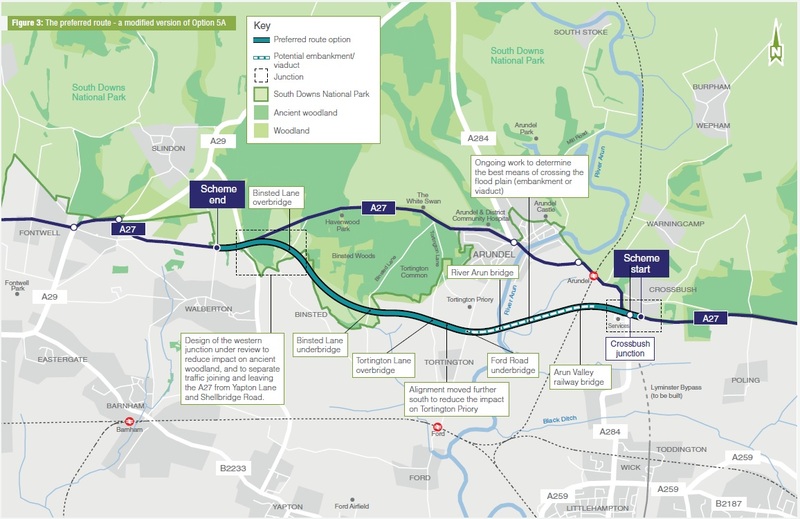 This shorter route would aim to improve flow without undermining the 2050 Vision of the South Downs National Park; the South Downs Society supports the non-dualled version (as does CPRE Sussex). Option 1 is assessed by Highways as the best value for money and the least damaging to the environment. But it is opposed by OneArundel who want a fully offline bypass away from the town, on the Option 3 route. This is the old Pink-Blue route, through Tortington Common. It was chosen in 1993 as the Preferred Route, as the least-worst fully offline bypass option in terms of its impact on the environment and on communities. Before it could be built it was rejected by Alistair Darling in 2003, due to its impact on the beauty of the Arundel watermeadows. 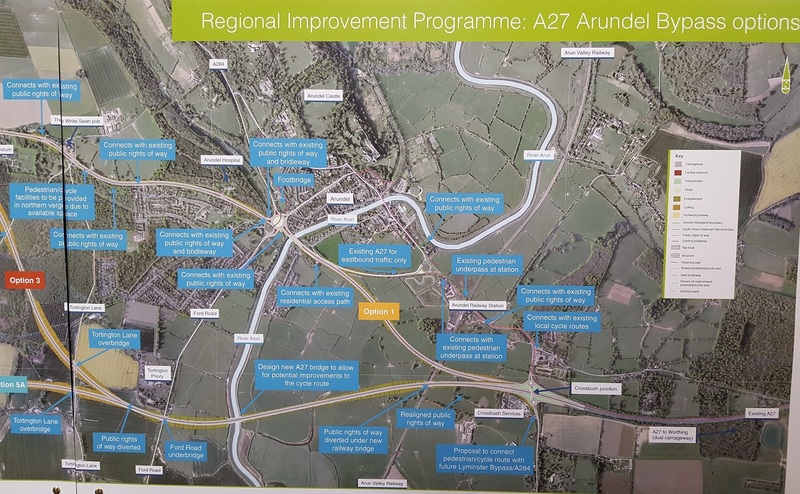 It was given to Highways England as 'the starting point' for the Arundel A27 improvement proposals in the Roads Investment Strategy 1 program. It has been supported by West Sussex County Council, Arun District Council and Arundel Town Council. This route would, in addition to the damage to Tortington, divide and destroy the landscape and community of Binsted. It goes through the historic and beautiful Binsted Park, a stone's throw from the Manor House, Binsted Manor and the Madonna Pond. It severs ancient woodland, runs through community- and National-Park-managed hedgerows and footpaths, and crashes past the medieval Moot Mound into the archaeology-rich broadleaved ancient woodland of Hundred House Copse. The damage is equally devastating or worse in areas not seen in this drone film, north-westward past the Moot Mound into the ancient woodland of Hundred House Copse, and south-eastward through the beautiful and historic Binsted Park landscape between Binsted Manor and the Manor House. Film of these is to be obtained, to complement the video below which gives an overview of central Binsted. Beautiful Binsted, filmed below by www.droneswork.co.uk. The glorious views to and from Arundel would be scarred by massive embankments bearing loud high speed traffic. All offline routes would cause severe harm to the Arun Valley wet meadows and to Tortington village. For information on the wide-ranging community impacts of the above Binsted Option, see www.binsted.org . "Binsted is a wonderful, mystical place, a little gem held in the past, vitally important in the life story of Laurie Lee, most of whose poems were inspired here. "Here is an extraordinary example of a parish unblemished by the modern world, with woodlands and wildflower meadows, and the exquisite little Norman church whose timeless quietness and beauty must surely be left undisturbed in the 21st century." Option A - Wake-up call. Option B - Sleep-in protest. 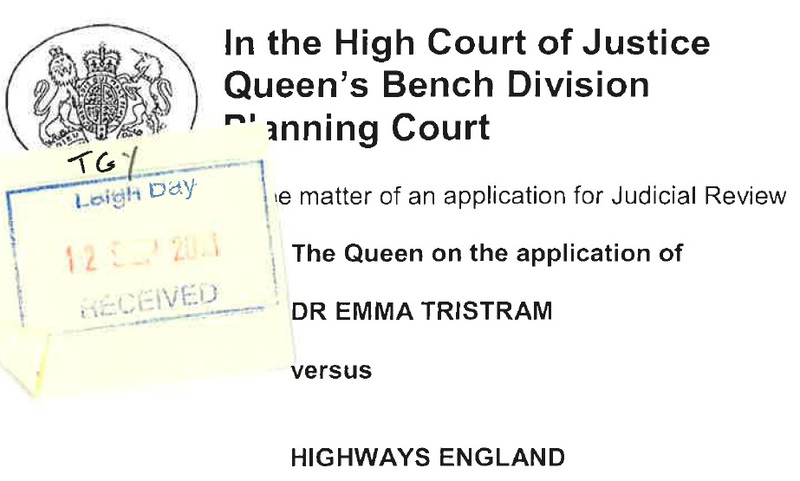 "Save Arundel's countryside from bypass ruin"
Dr Emma Tristram's Judicial Review case showed evidence that due to serious errors and omissions, "something went clearly and radically wrong with the consultation" following which Highways England had decided upon Option 5A as their Preferred Route. This significantly affected the impression given of the relative traffic benefits, and of the relative environmental impacts, of the options. 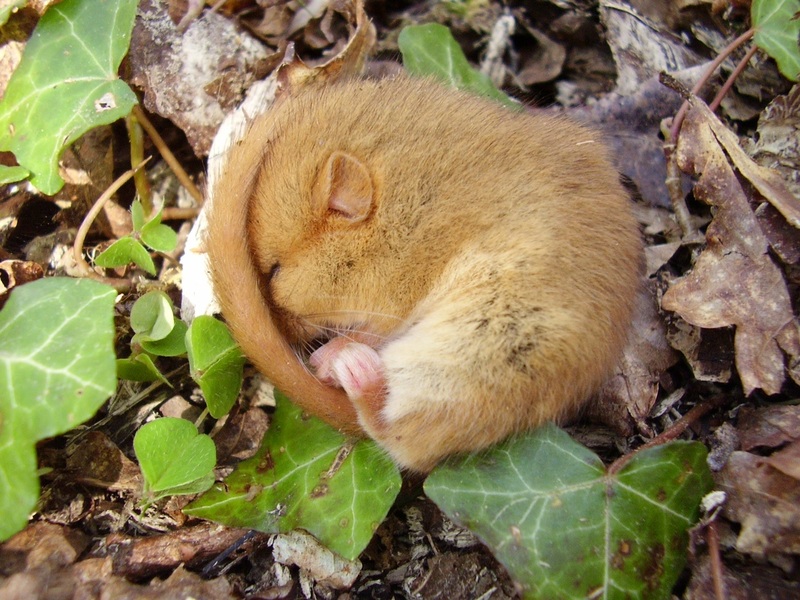 The South Downs National Park Authority also applied successfully for Judicial Review of the decision because it had not properly considered impacts on, or alternative options to reduce impact on, the National Park. Highways England have responded by announcing that they will undertake a fresh non-statutory consultation in 2019, with more and better information given and with corrections to relevant errors, and with a fully open mind as to what option they will choose in a fresh Preferred Route Announcement. 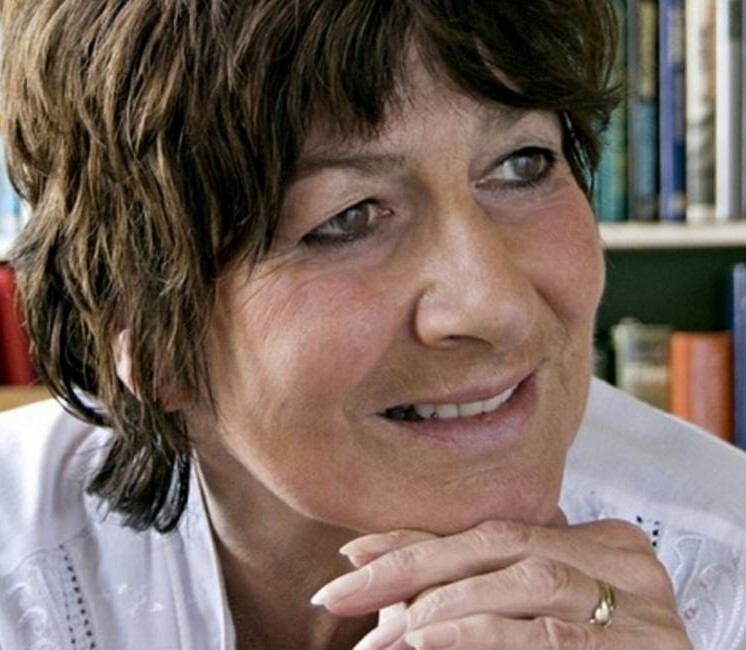 They have paid the legal costs of both Dr Emma Tristram and the National Park Authority. ABNC has been lobbying since the 1980s to protect beautiful countryside in Binsted and around Arundel from destructive A27 Arundel Bypass options.